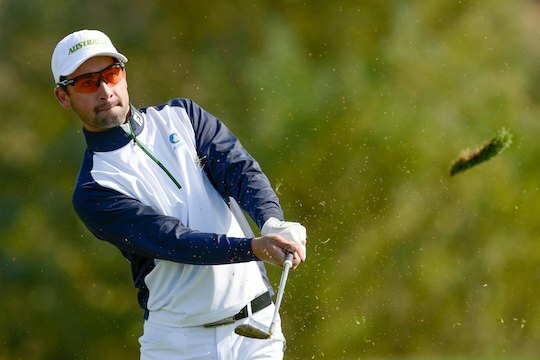 Australians Brady Watt and Oliver Goss remain just three shots off the pace following the second round of the Asia-Pacific Amateur Championship being played at Nanshan International Golf Club in China. Watt fired rounds of 71-74 to be at 3-over-par, with Japan’s Shohei Hasegawa and Lee Chang-Woo sharing the lead at even par. Goss opened with a 1-over-par 72 and followed that with a second round 2-over-par 7 to join Watt in a tie for 7th position. Taylor Macdonald, winner last week at the Keperra Bowl in Brisbane, continues to exhibit fine form to be at 4-over-par and in a tie for 10th, a shot behind his fellow Aussies. Hasegawa, a 21-year-old who attends Osaka Gakuin University, mixed three birdies and two dropped shots in a round of 1-under 70 in challenging winds that gusted up to 25 miles per hour throughout the day. His two-day total of level-par was matched by the in-form Lee (72), who ended a run of 15 consecutive pars with a birdie at the 16th before back-to-back bogeys over his final two holes. Guan Tianlang, who turned 15 on Friday, will need to be at his very best if he is to successfully defend the title he won in Bangkok last year. Guan repeated his opening score of 74 in the second round to lie in a share of 17th, six shots off the pace. At day’s end, 61 players survived the cut at 17 over par. Aussies to make the weekend include Lucas Herbert at 6-over in a tie for 17th, Daniel Hoeve at 10-over-par to be in a tie for 35th position. Geoff Drakeford was the only Aussie to missed the cut finishing with a disappointing 24-over-par total following rounds of 88-78.